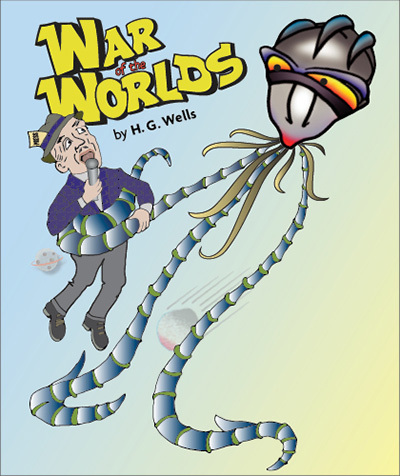 Aliens have attacked the Earth many times since H. G. Wells wrote his classic story, War of the Worlds, late in the nineteenth century. And the world-wide attack has been reported from many vantage points, ranging from England to New Jersey. But never before has it been reported from Bigfork. Michele Shapero directs this fresh new script as local playwright David Vale corrects that deficiency and local radio station KGEZ reports the story. While the aliens may be familiar, the rest of the cast is made up of characters not included in earlier reports, including John Hendricks of station KGEZ. Join us and learn first hand how Bigfork and the rest of the world fare as John and his crew from KGEZ broadcast live from the Bigfork Center for the Performing Arts. John Hendricks: A notable local radio personality, playing himself. Stacie Murray: Another local radio personality, playing herself. Man 1: (Ryan Langford) A radio show personality playing multiple characters. Man 2: (John Goroski) A radio show personality playing multiple characters. Woman 1: (Michele Shapero) A radio show personality playing multiple characters. October 20, 21, 27, & 28, 7:30 p.m.
October 22 & 29, 2:00 p.m.
Click on the images below to tour our website.